Clair was out and about in Southampton at the weekend and needed somewhere for a meal with her friend in the evening. Not only that, they needed somewhere for Breakfast the following morning.........here is somewhere that delivered both!! Unfortunately, the review here cannot go into starters or desserts as we were late in eating in the evening, mostly because finding the restaurant was not that easy!!! It is within easy reach of the Travelodge (2 min walk) but at night, the signs are not very well lit meaning you can easily walk past this quaint little eatery. Finally ordering our meals at 9.15pm, we were served fairly quickly with our choices. In terms of Grubgang prices, it would be viaible to do three courses, if you choose a side order of garlic bread or olives instead of a starter. The prices of mains range from 9.99 -19.99 so you do have to be a bit selective with your £20 limit!! The food was delicious. I had the meatball pasta which was cooked perfectly!! The staff were friendly and the interior of the restaurant is modern and very clean. As we didnt have desserts, we decided to try their breakfasts! They advertise they are open "From 9am" for breakfast. Well, we waited outside for 20 mins from 9am before the door opened. We were just about to leave to find somewhere else when we were welcomed in. Not a good start!! A full English costs £7.95 and includes fruit juice as well as tea or coffee. Some may argue the cost is a bit steep, but with the inclusions of the drinks, i would argue that it was good value for money!! 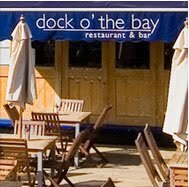 So, in terms of this visit to Dock O The Bay, we have to take into account the dark signs at night and also the lateness of opening for breakfast. A lovely place to eat on the whole and i would recommend to anyone staying at the nearby travelodge to try it out.